ROA continues to focus on passing legislation that would extend Veterans Status for Federal Hiring Positions. Use the ROA letter posted on the ROA website to contact your Senators and ask them to support S. 1325 (Sen. Jon Tester), “Better Workforce for Veterans Act of 2017” or to request a floor vote on H.R. 1367 (Rep. Brad Wenstrup) that includes the needed legislation. ROA urges Congress to confer veteran status for purposes of federal hiring veterans’ preference on Reserve Component members after 180 “cumulative” days on active duty versus “consecutive” days on active duty. The formal business meeting of the 2017 National Convention was called to order by the President, Col. James R. Sweeney II, USMC (Ret. ), on Sunday, 23 July 2017. The vice chair of the Credentials Committee, CAPT Gary J. Ausman, USCG (Ret. ), reported that 98 delegates, representing 33 departments had checked in. Representation allowed based on association membership was 47 departments, 317 delegates with 634 votes. ROA Executive Director, Jeffrey E. Phillips called role, then announced a quorum was present. Twelve new members were elected for two-year terms on the Executive Committee and president-elect, Col. Donald L. Stockton, USAF (Ret.) was sworn in as the new National President. View full list of newly-elected officers. During its annual convention held in the Washington, DC, area, ROA on July 22 recognized journalists, serving members of the Reserves and Reserve Component units whose excellent performance has set them apart. For the first time in many years, the association recognized with the Col. Thomas F. Royals National Minuteman Media Award three journalists whose work furthered initiatives supporting members of the Guard and Reserve and their families. Alex Horton was recognized for his fair, balanced, and informative writing on the use by the military of 12304b mobilization authority to involuntarily deploy Reserve and National Guard members. His November 25, 2016, Stars and Stripes article, “Pentagon holds GI Bill benefits for reservists,” revealed that deployments under 12304b do not earn key benefits otherwise awarded mobilized service members. His identification of this discrepancy to the public and the nation’s lawmakers has helped move law and policy toward equity for America’s Reserve Components. Horton is now with The Washington Post. John Donnelly, senior staff writer at Congressional Quarterly Roll Call, wrote an article that exposed the inequity in survivor benefits paid to families of a Reserve of Guard member who died while on inactive duty training orders. The article, “Some Survivors of the Fallen Are Shorted on Pentagon Benefits,” helped influence legislation signed into law last year, that corrected the inequity. Bennett Hall, special projects editor for the Corvallis-Gazette Times, of Corvallis, Oregon, wrote an article about U.S. Marines deployed under 12304b involuntary mobilization authority who, because of the nature of that authority, did not get benefits received by active duty forces, such as the GI Bill. His article, “Reservists denied G.I. Bill,” helped influence efforts now underway to reform the law and add the benefits. The Chief Warrant Officer 4 Michael J. Novosel Award went to Chief Warrant Officer 2 Cynthia Oliver, Coast Guard Base Miami. Recognition as Army Reserve Outstanding Junior Officer of the Year went to 1st Lt. Christian Bionat, B Company, 338th Military Intelligence Battalion, 648th Regional Support Command, Fort Riley, Kansas. The 900th Quartermaster Company, El Paso, Texas, won Army Outstanding Large Unit award, and the 342nd CBRN Company, of Urbana, Illinois won the Outstanding Company Size Unit award, and Detachment 5, EUCOM Army Reserve Element Joint Analysis Center, Patterson AFB, Ohio, won Outstanding Small Unit. 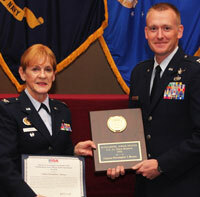 Recognition as Air Force Reserve Outstanding Junior Officer went to Capt. Christopher Barnes, 26th Space Aggressor Squadron, Schriever, Colorado. The 96th FTS Functional Check Flight Team, Laughlin AFB, Texas, won the Maj. Gen. Tom E. Marchbanks, Jr., Award and the Outstanding Non-Flying Unit Award went to the 9th Combat Operations Squadron, Vandenberg, AFB, California. 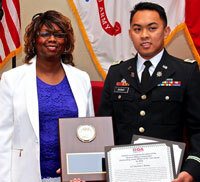 Recognition as Navy Reserve Outstanding Junior Officer of the Year went to Lt. Cmdr. Thomas Hoskins, NR NORAD and NORTHCOM Headquarters. Recognition as NOAA Outstanding Junior Officer of the Year was Lt. Joseph Phillips, Technical Operations Coordination Meteorologist, Ocean Applications Branch, Ocean Prediction Center, at the University of Maryland College Park campus. Recognition as Coast Guard Outstanding Junior Officer of the Year went to Lt. Benjamin Gross, Port Security Unit 309, Port Clinton, Ohio. Recognition as Coast Guard Outstanding Chief Warrant Officer of the Year went to Chief Warrant Officer 2 Cynthia Oliver, Coast Guard Base Miami. The Rear Adm. Bud Sparks Award (Category 1) was won by Coast Guard Station, Fort Myers Beach, Florida. The Rear Adm. Bud Sparks Award (Category 2) was won by Coast Guard Sector Delaware Bay, Philadelphia, Pennsylvania. The Ninth Coast Guard District, Cleveland, Ohio, won the Admiral Russell R. Waesche Award (Category 1). The Pacific Area Deployable Specialized Forces Support Branch (PAC-13), Alameda, California, Ohio, won the Admiral Russell R. Waesche Award (Category 2). Esper is President Trump’s third nominee, after Vincent Viola and Mark Green withdrew their candidacies due to business ties and controversial past remarks on the LGBTQ community respectively. 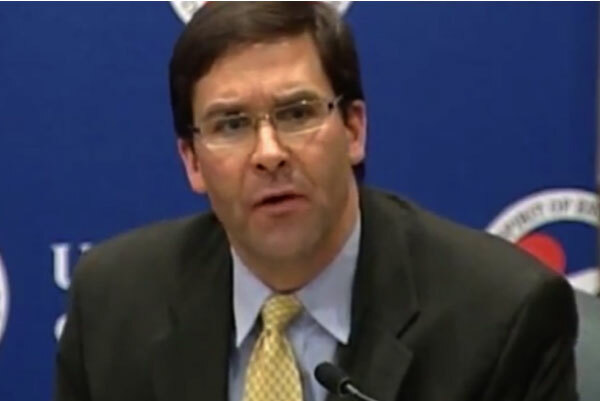 Mark Esper, a Raytheon lobbyist has been nominated to be Secretary of the Army. Esper currently is a Vice-President at Raytheon and has worked in the defense industry previously. He graduated from West Point in 1986 and served in the First Gulf War. After leaving the Army, Esper worked as a Congressional staffer, then at the Pentagon, and advisor to Fred Thompson’s failed 2008 presidential bid. His insider experience marks a shift from Trump’s previous Army Secretary candidates who were D.C. outsiders. 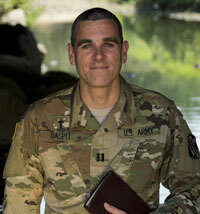 ROA awarded Army Reserve Captain Doug Daspit the Chaplain of the Year award at our National Convention. Captain Daspit exhibited the heart and dedication of a servant leader, ministering to his fellow Louisiana soldiers hit by flooding. Daspit provided one-on-one counseling to 38 families who were adversely impacted by some of the worst flooding in Louisiana since Hurricane Katrina. This counseling began on Daspit’s own time before he was called on military orders. ROA thanks Captain Daspit for his selfless service and is honored to have awarded him the Chaplain of the Year Award. At the ROA National Convention Captain Christopher J. Barnes was selected as the Reserve Officers Association Outstanding Army Reserve Junior Officer of the Year Award for 2016. 1st Lt Christian I. Bionat has served in several positions of responsibility at the company, battalion and 2-star command levels. He participated in and facilitated a CONUS training mission involving 100,000 Reservists across the United States. In his role as Intelligence Officer for a Chemical, Biological, Radiological, and Nuclear battalion that conducted combined and joint partner missions with allied forces in Canada, he performed his duties in a manner that exceeded the expectations of his rank and billet. His military and civilian accomplishments have distinguished him above his peers and for that ROA is proud to recognize him as the Junior Officer of the Year. Congratulations 1st Lt. Bionat! The Army National Guard held its 2017 Army National Guard Competition at Camp Riley, Minnesota to determine who the top soldier and NCO for the ARNG. After a grueling competition with 12 fellow competitors, Army Sgt. Grant Reimers (right) of Nevada’s 1859th Transportation Command was named Soldier of the Year while Army SSgt. Daniel Sebo (left) of Minnesota’s 2nd Battalion, 175th Regiment (Regional Training Institute). The competition involved various tactical, physical, and mental challenges from land navigation to medical exercises to sheer endurance through a 13 mile muck ruck run. 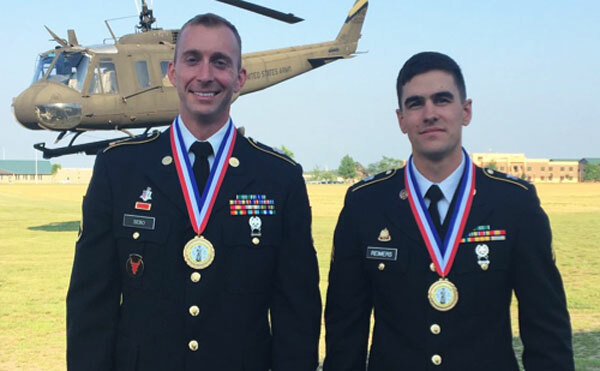 Overcoming these challenges has set the stage for these two National Guardsmen to face the 2017 Department of the Army Best Warrior Competition, scheduled for October. ROA wishes them the best! At the ROA National Convention Lt. Benjamin Gross was selected as the Reserve Officers Association Outstanding Coast Guard Reserve Junior Officer of the Year Award for 2016. Lt Gross skillfully led all operational planning in support of the U.S. Secret Service for the 2016 Republican National Convention. Leveraging extensive partnering and engagement, Lt Gross expertly executed the planning process within the NIMS, and developed a comprehensive OPORD that addressed law enforcement, force protection and critical infrastructure protection. Lt Gross served as chief planner for the first-ever Coast Guard element to participate in the Naval Expeditionary Combat Command’s training, evaluation and certification course for Embarked Security Teams (EST), resulting in all members becoming CENTCOM/5th Fleet EST certified LT Gross’ distinctive accomplishments are in keeping with the highest standards of the United States Coast Guard and for that ROA is proud to recognize him as the Junior Officer of the Year. Congratulations Lt. Gross! At the ROA National Convention Lt. Joseph Phillips was selected as the Reserve Officers Association Outstanding NOAA Commission Corps Junior Officer of the Year Award for 2016.Lieutenant Phillips displayed sustained and significant leadership throughout 2016. He coordinated NOAA’s contribution to The American Practical Navigator, or “Bowditch.” He was responsible for overseeing the development of the international S-412 “Weather Overlay” Product Specification for integrating weather information into shipboard Electronic Charting Display Information Systems. The distinctive accomplishments of Lieutenant Phillips reflected credit upon himself and the NOAA Commissioned Corps. For that reason, ROA is proud to have granted him the Junior Officer of the Year Award. Congratulations Lt. Phillips! Lt. Cmdr. Thomas Hoskins, assigned to Navy Reserve North American Aerospace Defense Command and Northern Command Headquarter, was selected as the ROA Navy Reserve Outstanding Junior Officer of the Year (JOY) for 2016. The caliber of the candidates and his selection is indicative of the outstanding quality of the Navy Reserve Junior Officers. Lt. Cmdr. Hoskins is considered the Best of the Best. He was not able to attend the convention but will be recognized at a future event. The Marine Corps KC-130T that crashed a few weeks ago experienced failure at cruising altitude and fell to the ground in two different pieces. The Marines have not commented on potential causes of the crash, except that the plane belonged to the Marine Corps Reserve, and that the investigation is still ongoing. It is unusual, according to the military, for a plane to experience issues at cruising altitude, considering the airplane has some of the best safety records of any other aircraft that the military flies. Lt. Gen. Miller addressed the Reserve Chiefs' Panel at the ROA National Convention on, July 22, 2017 and spoke about the demands of service place on Reserve Citizen Airmen who have contributed over 10,000 operational taskings across the U.S and overseas. Today the Air Force Reserve is the fourth-largest major command even though they operate with 16,000 fewer Airmen and 220 fewer aircraft then during Desert Storm. 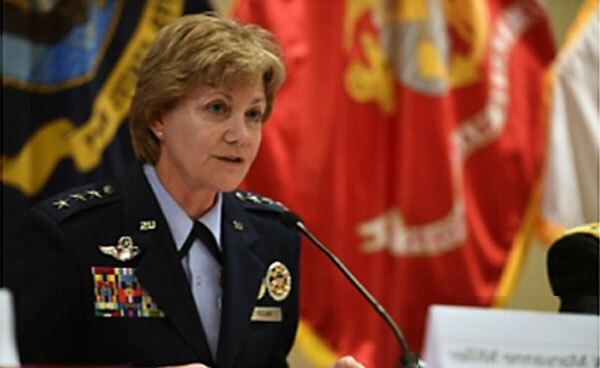 General Miller noted relief for the Air Force Reserve is expected in Fiscal Year 2018 because of the 800 positions added in the President’s Budget. She also discussed the importance of modernization and recapitalization. Later that afternoon Brig. Gen. Hill addressed the Air Force Service Section meeting to explain the impact of Congressional legislation in the National Defense Authorization Act for Fiscal Year 2018. The end strength changes to the Air Reserve Technician (ART) program are expected to have the most immediate impact, if passed. An Air Reserve Technician provides the same responsibilities in their full-time civil service position as they do as a Reservist. The House passed Section 501 which would reduce the conversion of technician positions to civil service positions only. Currently the services are directed to convert 20 percent of the technician force and the House reduces this to only 4.8 percent that must become federal civil servants. This would help to retain many more dual status positions to manage the part time Reserve force. As dual status technicians, they seamlessly move from being a civilian during the week to being a Reservist on weekends or when on active duty orders. This system ensures continuity for the force. The House did however eliminate the non-dual status program by reducing to zero the non-dual status category which eliminated over 2400 positions. The Senate took a different approach to reducing the dual status program by establishing minimum numbers that represented significant reductions but they did allow for non-duals status positions. ROA is communicating with Congress about the importance of the dual status program and the need to retain this category of end strength support to the Reserve mission. At the ROA National Convention Captain Christopher J. Barnes was selected as the Reserve Officers Association Outstanding Junior Officer of the Year Award for 2016. 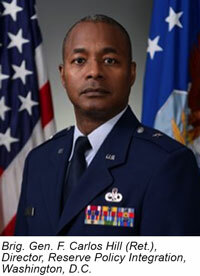 He is the Chief of Training with the 26th Space Aggressor Squadron, Schriever Air Force Base, Colorado. Captain Barnes led a 13-person team of active duty, reserve, and civilian instructors and developed a 12-month strategy to rebuild the unit’s weapons and tactics, training, and evaluation programs. This effort contributed to the unit’s delivery of 11,000 training hours to over 6,000 personnel in 32 United States Air Force Weapons School, RED FLAG, Combatant Commander, and sister service operations exercises. Congratulations Captain Barnes! More than 40% of military family’s live off-post ... many in silent danger according to an e-mail from the Red Cross. Last year, the Red Cross focused on this problem after they identified more than 100 military connected communities around the country at high risk of death and injury due to home fires. Yearly, the Red Cross responds to nearly 66,000 disasters. On average every day, seven people die, 36 suffer injury and over $7 billion in property damage occurs because of home fires. Thousands of military families have suffered property damage in the tens of millions of dollars, injury and death over the past five years. To help protect our military families, last year, the Red Cross installed nearly 40,000 smoke alarms, and educated tens of thousands of families in military and veteran connected communities on fire safety and preparedness. This year the National Red Cross, Sound the Alarm program hopes to install 100,000 alarms. As part of the Harry W. Colmery Veterans Educational Assistance Act of 2017 (H.R. 3218), servicemembers who receive the GI bill have more parameters when transferring it to their dependents. In bill section 109, it outlines how servicemember can transfer any remaining educational assistance to another dependent if the first dependent they gave the benefit to dies. The servicemember does not have to be currently serving in the military for them to do this. Secondly, if the servicemember dies, the dependent who first received the educational assistance can still transfer the benefit to another eligible dependent.